Second day of climbing was a good one. 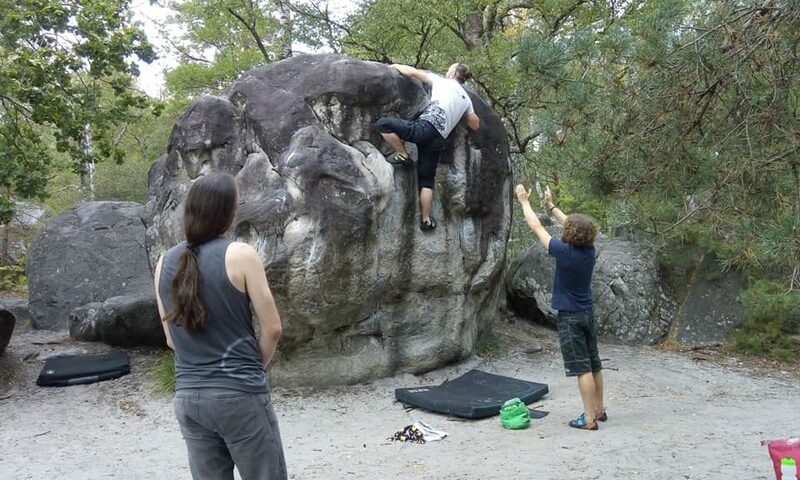 Jim challenged me to climb blues at La Canche aux Merciers which was a great little bit of motivation for climbing hard. It was a bit of an warm and overcast day, so the rock was a little sweaty, not helped by our greasy fingers I guess, but after a bit of a warm up with Lolly on some yellows, we got cracking on with blues. Suddenly I found my self with some oomph, pulling hard and topping out with some mantel ability I never realised I had. Not entirely sure where that’s come from, but more of it please! Blue 22 was possibly one of my favourites, a repeat of something I climbed back in 2010 with Jim and Lorraine and it fell after a few attempts. Pretty sure my style was somewhat different this time, with a couple of sneaky heals and flags to make the moves more controlled. I was really quite happy with it. Other problems of note include Blue 40, which was a pretty tall prow which left you hanging over the point of a boulder behind. 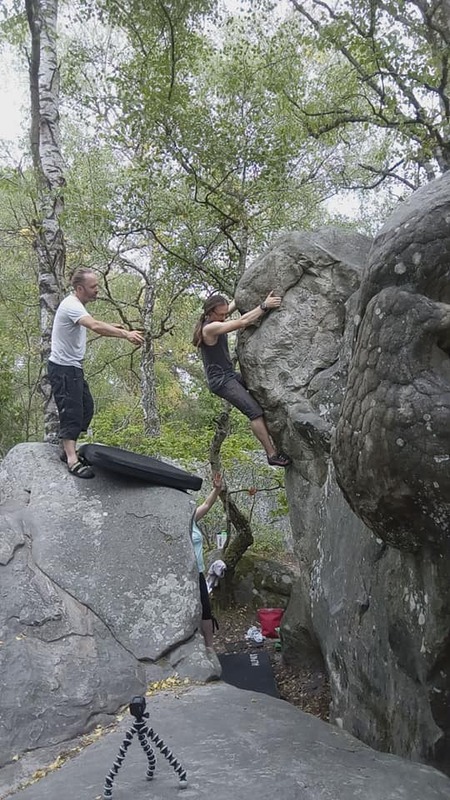 Although the holds were mostly huge, the top out was a little bit sketchy, meaning the exposure made it feel really hard indeed. After a first attempt and backing off as my grip gave out, I had another go and after dealing with some truly awful footwork on the first half, finished it by getting those feet high. There are some videos floating around which will end up on this blog at some point soon. As a mentioned above, fingers and toes are feeling pretty sore now. especially the right big toe. I think it’s a bit bruised again. We’ve planned to go to Rocher du Potala tomorrow which is another place I’ve not been so I’d like to be able to actually get on stuff. Fingers crossed I heal fast!